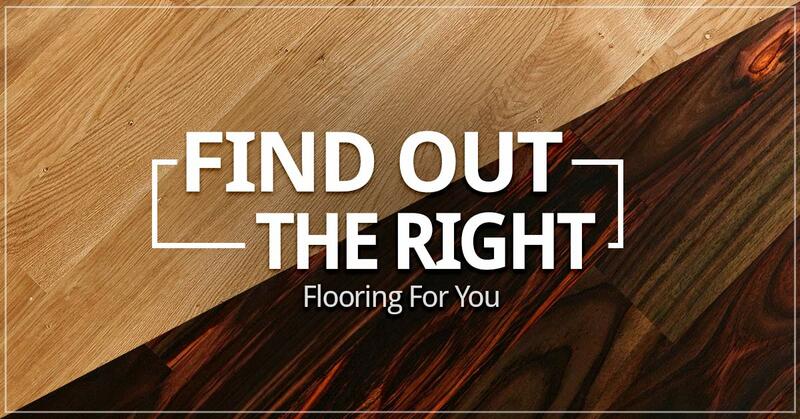 Making that final decision about the flooring in your home can be difficult. Like most people, you may be caught between two options that you know would look fantastic. As much experience as we have, we understand that the final decision is up to you because it’s the home you are going to live in. 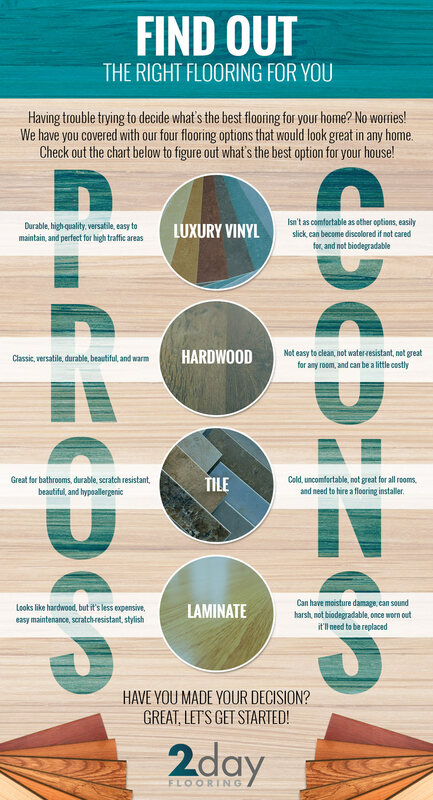 We can guide you toward flooring options that would be best for your home, but that doesn’t mean you won’t turn indecisive in the end. To help you decide what the best option for your home could be, we’ve laid out our four different flooring options that you can take advantage of when you come to 2 Day Flooring. Warm, beautiful, and traditional, hardwood flooring is a familiar option for many because of the more traditional look it provides. If you are going for something a little more classic, hardwood can be the best option for any home. One thing to be aware of about hardwood flooring is that it needs to be taken care of much more than other options on our list. If you live by yourself or with your partner and you have the time to put into caring for it, then it’ll be bold and beautiful for the long term. If you’re looking to redo your bathroom, kitchen, or your patio, then tile can be the best choice for your home. What’s great about tile is that it is hypoallergenic and it’s easy to maintain. It can also increase the value of your property because of the beauty that it offers. In addition, it’s a popular option for people who are looking for lasting allure in their home. One downside of tile can be that it can be cold on the feet. In addition, it’s best to hire a flooring installer because it can be difficult to make sure all of those small tiles line up perfectly. 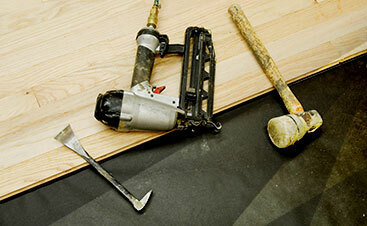 This affordable option for flooring is a great choice because of everything it has to offer. Not only is it easy to clean and maintain, but it’s perfect for areas of your home that are high traffic. Vinyl flooring comes in all shapes and sizes and there’s a style that everyone loves, but it’s not the most comfortable option in a home. While you may want to put it in your living room, your kids will not enjoy playing in their because of the hardness, so be aware of the room you want to use this option in. 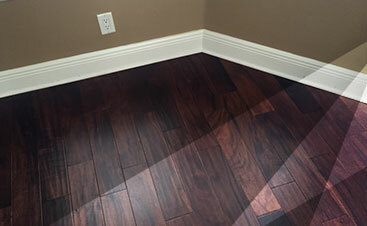 Laminate flooring is one of the more popular options we offer for homes that have small children and animals. This option is so popular because if your animal’s toenails scratch the flooring or your kids gets a little too excited about their juice and there is a spill, the laminate flooring will not be damaged. One thing you should know about laminate flooring is that it’s great for high-traffic areas; however, if it starts to get a little too worse for wear, you’ll need to replace the entire floor. 2 Day Flooring is proud to serve the residents in Tampa, FL, and the surrounding areas. We have served the residents in this area for several years and will continue serving those in the area for several more years. Providing sought-after flooring options to the community to ensure they have beautiful homes is one of the best things that we do best. Our goal is to ensure that you’re happy with the results and that you don’t have to deal with the stress or the hassle of floor installation. Contact us today for more information!